A passenger plane carrying 295 people on it's way from Amsterdam to Kuala Lumpur has crashed in eastern Ukraine near the Russian border. Ukrainian officials have said that Malaysian Flight 17 was at its cruising altitude of 33,000 feet when it was hit by a surface-to-air missile. The burning wreckage, including bodies and luggage, is strewn over a wide area near the village of Hrabove in eastern Ukraine. Pro-Russia separatists have denied shooting down the plane, however they may have been supplied with the self-guided Russian-made Buk launcher capable of targeting a plane up to 72,000 feet. The black box has been recovered by separatists and they plan to hand it over to Russian authorities. Many aviation authorities have issued warnings not to fly over Ukraine. Discussions are being held for a truce and cease fire to allow humanitarian aid into the region. The US has also concluded that the plane was shot down by a missile. They say a radar system detected a surface-to-air missile system turn on and track an aircraft and a heat signature was detected at the time the airplane would have been hit. The Stanley Cup enjoyed a beautiful day down the shore today courtesy of former Flyers’ coach John Stevens. Stevens, currently an assistant coach of 2014 champion LA Kings, owns a house near Sea Isle City, NJ. 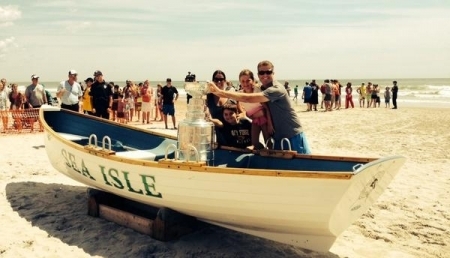 The cup was placed inside a SIC row boat on the beach and hundreds of fans lined up down the sand to get an opportunity to take a photo with the cup and place their hand on the trophy. It's been 40 years since the Flyers have brought the the Cup home for the club, but local hockey fans showed how hungry they are for it to be theirs. The suspect who Police say murdered a recent art school student and dumped her body in a duffel bag has been arraigned. 22-year-old Jeremiah Jakson has been charged with Murder, Robbery, Burglary, Theft, Abuse of Corpse, and related offenses in the death of 23-year-old Laura Araujo. He is being held without bail and is due back in court in August.